Cactus farms need water? Correct me if I'm wrong... –The preceding unsigned comment was added by Bbqroast (Talk|Contribs) . Please sign your posts with ~~~~! 4 Square cacti farm (with water transport). I have yet to use the Pre-Release so I don't know if the farms are broken in 1.2.5 but I know that in Minecraft 1.2.4 the Cacti Farms are NOT broken. :Since I have started making cacti farms in 1.2.4 I noticed that it took an insanely long amount of time to produce 1 cacti piece. The reason for that is because the cactus knows that a block is next to where it wants to grow and it does not want to grow only to have its top fall out. I don't have the amount of time for 1 to grow with a top next to it but it is far faster to cut a cactus without the top falling off. The best way to get around the LOOOOOOOONG wait is to just make the farm huge. It produces more in the same amount of time that way. So, with the advent of the full game, my fully automatic cactus farm that had previously turned roughly 1000 cacti per hour has fallen to some small fraction of that. Am I the only one experiencing this? 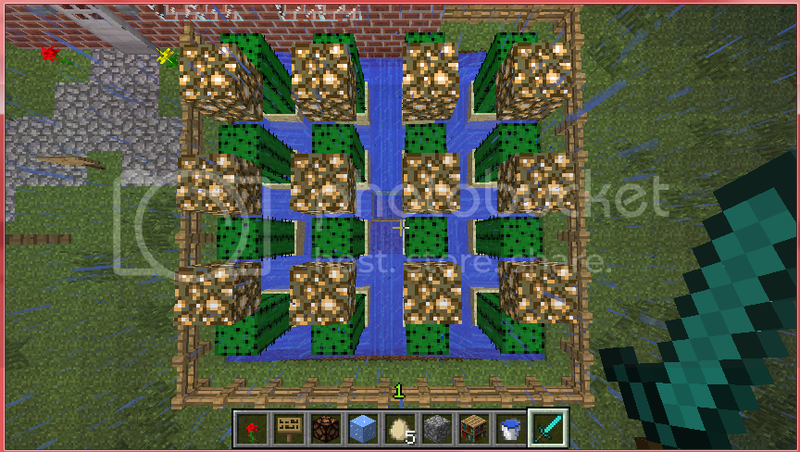 Square cacti farm (with water transport). I have made an automatic cactus farm. It's a big square and the water will transport the cacti to the middle. Is it worth adding to the article? This page was last edited on 25 April 2013, at 04:56.